← So, what about contracts? Just reflecting how five years on, this service still have such a profound effect on me. Whenever I attend this service and as we move around the stations, I can feel myself transported in time and place, I imagine the feeling of desolation that must have overcome believers as they stand and watch the one who they had held as their saviour CRUCIFIED! And then I know that I cannot let his death be in vain – “his wounds paid my ransom”. I must now look forward to Sunday, when we shall be overcome with joy in the knowledge that he is RISEN. Come and join us tomorrow at 10:00a.m. at St. Barnabas Church in Mitcham as we celebrate the RISEN Christ. The Stations of the Cross refer to a series of pictures or other artistic representations used to depict the last events leading to the crucifixion of Jesus Christ. Although commonly used in conjunction with prayer and meditation as a spiritual devotion during Easter, they can be used at any time of the year. 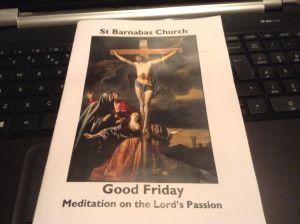 St Barnabas Church in Mitcham holds a beautiful devotional on Good Friday each year at 2:00p.m. Yesterday’s service was led by Fr. Joabe Cavalcanti and Rev Trudy Payne and I have included some excerpts from the devotional below. If you are not able to get to a service near you, then perhaps just reflecting on this devotional might keep you in touch with the most important event in the Christian Calendar.